Age almost always comes with reduced freedom of mobility. Thankfully, technology in the form of mobility scooters allows you to explore your environment and run your own errands even when age beckons. Mobility scooters are not just a faster way to get from point A to B. For people who can no longer walk long distances, these vehicles are lifesavers. Power scooters are ideal for people who can still walk a little bit but have problems with stamina and strength. Purchasing a power scooter can give grandpa, grandma, parents or you back the freedom and independence you’ve always known them for. Don’t buy just any mobility scooter. Decide what is the most important criteria for you or the person who’ll be using the scooter. Portability, traveling long distances, weight capacity, comfort, speed or maneuverability. 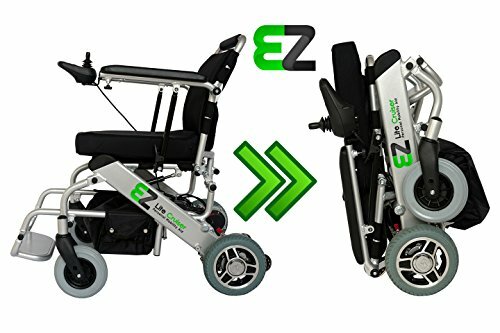 Our best mobility scooter & wheelchair reviews will make it easy to pick the best mobility scooter & wheelchair for your needs. If you or someone you know have trouble going to the grocery store, no longer plans vacations because of the amount of walking involved, or having trouble getting around the house. You should consider trying a mobility scooter or Electric wheelchair. For more in-depth info, please refer to the ‘Contents list’ to scroll to our reviews & recommendations. Drive Medical Spitfire Scout offers excellent value for the price. If you want a lightweight, compact scooter that maneuvers well on a rough terrain all in an affordable package this is the scooter for you. Quick charging and a decent range make the Spitfire Scout perfect for outdoor ventures or trips to a supermarket. Affordability- at less than seven hundred dollars this model offers great value while not sacrificing functionality. Portability – the Spitfire Scout can be easily disassembled for transportation in car trunks see you don’t need a dedicated power chair lift installed on your vehicle. Maneuverability – the compact four-wheel design ensures that you will be able to navigate tight corners without sacrificing stability. Accessories – the Spitfire Scout is compatible with Drive medical cupholders, crutch holders, and interchangeable colored plates for customization. It also comes with an attached basket. If you’re looking for a scooter that gets you out and going without breaking the bank, the Spitfire Scout is a great choice. The Drive Medical Phoenix 4HD power scooter is ideal for you if you want good comfort but also the ability to take the scooter apart and with you in a car. This model allows you to use it around the house (non-marking tires), outdoors, or pack it up in the car and head out on a road trip. Portability – 4HD can be disassembled into 4 pieces without much effort. When taken into pieces, the heaviest part (front part of the scooter) weighs 46 lbs. Ergonomic throttle control – the hand controls on this scooter make a great option for people with limited hand strength. Ride in comfort instead of struggling to steer your chair. Non-marking tires – if you use your chair around the house a lot you don’t want to be marking up your floors. The tires on this model are easy on your floors and also offer anti-tip protection. Weight capacity – many travel scooters have a low weight capacity to make them more portable. Drive medical keeps the scooter portable while still making it accessible to people weighing up to 350 pounds. Range – you can take the Phoenix 4HD on a cruise for up to 15 miles on a single charge. If you’re looking for a solid all-around scooter that’s good for both indoors and outdoors as well as traveling and taking with you in your car then Drive Medical Phoenix 4HD Heavy Duty is your best choice. This model does not come with a headrest so if you have neck problems keep that in mind. If you’re looking for maximum comfort then take a look at the next scooter on the list (Shoprider Sunrunner). The Shoprider Sunrunner offers a great comfort for the price. This scooter comes completely assembled so all you have to do is plug it in, charge the battery, and then you are ready to go. The seat design allows for easy on and off access. The controls are very intuitive and this chair offers a smooth ride even on a rough terrain. 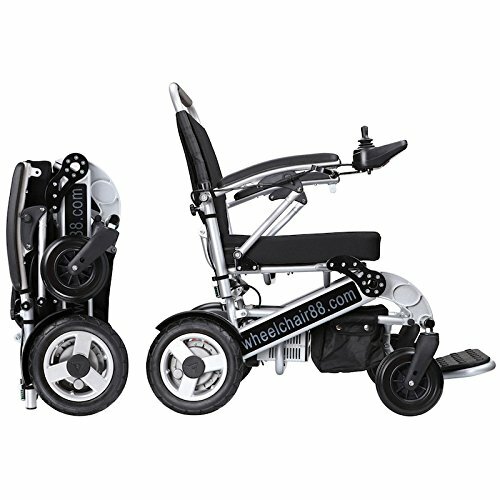 This model really does offer it all and is a great mobility scooter if you’re looking for maximum comfort. Choose between the three or four-wheel design – if you need maneuverability in tight spaces you can go with the 3-wheel model. 4-wheel model gives more stability. Headlight package – this model comes standard with a headlight for nighttime safety. Since scooters are low to the ground you want to make sure cars and bicycles can see you easily. Deluxe folding captain’s seat- this seat is super comfortable and offers a headrest for long trips. When you’re ready to store it, it easily folds down which can make a big difference. Controls – the controls are easy to see and allow you to adjust the speed with a twist of a dial. There is also a convenient battery indicator near the speed control. Shoprider Sunrunner 4 wheel isn’t for you if you’re looking for maximum portability, but Owners of this mobility scooter have put it through some pretty heavy use, with one using it for work and driving 10-15 miles per day, and another putting on about 2500 miles a year on it on very rough sidewalks and rough roads. In spite of that kind of usage, these scooters seem to hold up for about 6 or 7 years. Owners love the comfort and stability, the easy maneuverability, the dynamic brake system, the power, and the long battery charge that this scooter holds. We would highly recommend the Shoprider Sunrunner 4 Wheel Scooter for its versatility of performance, both indoors and on the road, its durability, and the high level of mobility and satisfaction that it gives to owners. This is the model for you if you’re looking for an all around good quality power scooter with excellent comfort and ease of use. It’s great for outdoors. With four 3″ x 9″ solid wheels and an 80-inch turning radius. Runs well on grass and dirt. Probably a bit bulky for indoor use. You might want to look at other 3-wheel models for use indoors. Comes with an 18-inch seat and a 325 lbs weight capacity making it not the most heavy duty machine out there, but nevertheless a good choice for someone 6 ft tall and more. All-new frame design easily disassembles into 5 lightweight pieces for convenient transport and storage. It’s not the most heavy duty or fastest (4 MPH), nor is it the most lightweight and portable, but the S74 is most praised for its great quality and durability, good battery life and comfort. There are three standard battery options for the Pride Go-Go mobility scooter; the 12 amp, 17 amp and 18 amp. Although it’s one of the lightest in its category, the EZ Lite Cruiser does not sacrifice power or durability. It can handle passengers of up to 264 pounds without any issues and features a brushless engine that is quiet and energy efficient. Now upgraded with high quality 250 Watt Brushless HUB motors, this powerful cruiser lasts up to 10 miles driving distance on a single charge. The power units are high-quality Lithium Ion Phosphate batteries and come in 10 Ah and 15 Ah configurations. By using a Dual Battery Connector, which can be purchased separately. You can double your travel distance without having to carry around an additional battery pack separately. To create the smoothest experience, the Standard Model also comes equipped with 8-inch rear rubber wheels that give it impressive traction. Because of this, you can use this wheelchair both inside the home, out and about, and even suitable for flight. It’s made of a sturdy aluminum alloy that is also extremely light, giving it a total weight of only 50 lbs including the battery pack. If its durability doesn’t surprise you, its flexibility certainly will! It is tried and true in the features it offers, quick and easy folding and unfolding, all within a small form factor, making it a truly portable power wheelchair. Its compact size makes it perfect to load in the boot, and a joy to store, especially if your place is tight in space. The frame has a roughly 24-inch width, which means it will fit through virtually every narrow hallway or doorway. Add a second battery for greater distances, mount a joy-stick on either arm-rest or choose from the great range of accessories for extra customisation. The ergonomic joystick allows the person seated to control the wheelchair without any problems because it’s extremely easy to use, even for first-time users. In addition to this, the armrests can also be lifted, so users can easily access the seat through one of the sides of the chair. Simple set-up, transportable, easy to clean, Portable, lightweight and easily maintained. Unsuitable for sand and gravel, the leg rests may not be the most comfortable, depending on your height and body type. We’ve tested this model and found it works great indoors as well as outdoors, it has the most number of accessories available to personalize the chair your own. Resulting in a great, all-around mobility device. EZ lite Cruiser Deluxe DX10 model is specially designed to provide you maximum comfort. Users comfort is enhanced by this wheelchair’s ability to recline in 5 different positions that allow you to be as cosy & comfy as possible. It is truly a futuristic wheelchair! It upholds the name of its EZ Lite predecessors by having incredible folding and unfolding capabilities. It is very lightweight yet compact ensuring an easy time for storage and transportation. It is simple, quick and easy to unfold your Deluxe DX10! Simply lift it up by the back support, and your DX10 Deluxe will do the rest for you. Equipped with Four 7.5″ Diameter and 2″ Wide Caster Front Wheels, and 10″ Rear Wheels, you can be sure of unbeatable traction, greater stability, and maneuverability. Perfect for smooth indoor and outdoor riding experience. The seat is lined with soft and comfortable removable back and seating cushions taking your relaxation to the next level. It is compact for storage and light enough to carry. The best part of this wheelchair is that the DX10 allows for customization enabling you an experience of your own choosing. This is facilitated by the ability to change the bolt sizes in the footrest and armrest. As a result, you can increase the length of the footrest and the distance between armrests in case the wheelchair feels small. The DX10 leaves nothing to chances as it is accessorized fully with equipment such as a handle at the back of the chair for carrying it while folded, a removable seat with cover for easy cleaning, adjustable armrests for easy access, the option to mount a joy-stick on either arm-rest, a seatbelt and a cup holder among other things to ensure it is convenient for your daily use. You’ll have a 10 Ah (Ampere-hour) battery for 10+ miles in driving distance, or can choose to travel even further with the 15 Ah battery, powering you for up to 18 miles! You can even add or combine an optional second battery to increase the travel range with this electric wheelchair. The battery has been reported by some users to drain fast. This, however, should not make you lose hope on an incredible chair as you can easily compensate by adding two batteries together for twice the functionality. If you’re looking for comfort, this is the one for you. Its versatility makes it perfect for using around the home or venturing out and about. Their ‘Deluxe’ line of power chairs — DX8 with 8″ rear wheels, DX10 with 10″ rear wheels, and DX12 with 12″ rear wheels. The EZ Cruiser DX12 is truly an upgrade from the DX10 due to the features it has. 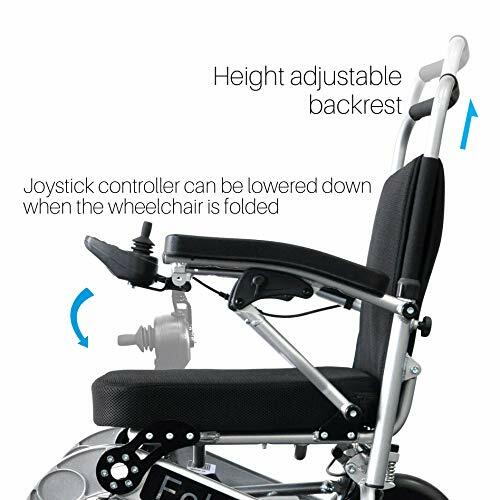 Just like the DX10, this wheelchair comes with the ability to customize it so as to fit your need by adjusting the footrest and the distance between armrests. The weight capacity of the DX12 is 305 pounds. It has rear wheels that measure 12 inches in diameter while the front wheels are 7.5 inches. The ground clearance is a relatively high 3.9 inches, which makes it easy to get around on slightly bumpier terrain. You can also choose between the 15 Ah and 10Ah battery. The lithium battery boasts up to 1000 power cycles. The 10 Ah battery gets over 10 miles of driving distance, while the longer-life battery (15 Ah) battery can go up to 18 miles before needing a charge. Do keep in mind that the 15Ah battery is forbidden from airplanes hence might be a bit limiting. The batteries have the ability to be connected together using a dual connector to increase the power. This means a driving distance of over 20 miles before charging is required. It also comes with a well-cushioned seat that reclines taking your comfort to a whole other level. With a tough durable frame that has warranty, you will be sure you are purchasing a genuine product. The impressively fast folding and unfolding capabilities paired with its compact design make it easy to transport and excellent for indoor use. With a top speed of 5 mph, the EZ Lite Cruiser Deluxe DX12 helps the rider to get around quickly. Though the turning radius is slightly larger at 33.2 inches, there is still plenty of sharpness to this wheelchair, in order to get maneuver in tight or crowded places. The EZ Lite Cruiser Heavy Duty Deluxe DX12 electric wheelchair boasts lightweight portability in a powerful package. There is enough power, speed, and battery life to keep the user on the move for well above many competitor models in its category. 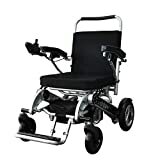 The seat is comfortable and adjustable, and the wheels keep the unit feeling stable and smooth. There is enough power, speed, and battery life to keep the user on the move for well above many competitor models in its category. The seat is comfortable and adjustable, and the wheels keep the unit feeling stable and smooth. The larger wheels can exhibit better performance on rougher surfaces. The advantage of the 12″ rear wheels over the 10″ rear wheels is that the 12″ have larger treads and are even better for more rough surfaces, such as patchy grass which may not always have flat ground underneath it. Generally, the larger the rear wheels, the better they’ll perform on rough terrain. Though it is still limited, they will not perform well on loose gravel or large gravel, where the wheels are unable to make contact with the flat ground. The Foldawheel PW-1000XL makes a great choice if you’re concerned with weight capacity. It can easily hold up to 330lb, yet the weight of this model when the battery is on board is just 57 lbs. This is about the maximum weight which you hold up to with a foldable power wheelchair, but I can confidently say that it is perfectly sufficient for big people. The frame is constructed of an aluminum alloy which has aircraft-grade quality. Compact when folded, roomy when open, and quick to assemble. The unit is ready for transportation in seconds and putting it in the trunk is super easy for the average adult. It also comes with a detachable joystick with good sensitivity to steer your wheelchair, a tough, secure travel bag, and worldwide usable charger so it’s ideal for traveling! The 10-inch rear wheels are big, comes with 4 string suspension and work well on uneven surfaces. The front ones have great swivel action. The slope capability of this model is quite good at 13 degrees. It is paired with anti-tilt support so you can expect to enjoy a stable ride even if the terrain isn’t perfectly flat. The turning radius of this model is 31.5 degrees and this is quite impressive. You can take even sharper turns quickly and securely without effort. These offer fantastic traction; able to handle heavy grass, gravel roads, and even cobblestones! It features brushless design motors, you can expect it to be dependable and fairly quiet. The distance from the ground to the seat is 18.5 inches while the seat’s width is 18 inches, so the model offers comfort even for those who are not particularly small. The seat has very thick padding which is a great advantage when you go on longer trips, but the padding could be better. The footrest has a perfect non-slip surface so you can enjoy a better foothold. The battery life is around 9.3 miles and can hold up to two additional batteries so you can triple the maximum distance. The extra batteries are sold separately. Could be heavy just for indoor use but this is a lot less than most of its counterparts. The armrests are nicely padded and easily foldable, they could be bigger. The benefits of the Foldawheel PW 1000XL power wheelchair include great maneuverability, quick and compact folding, comfy sitting and good battery life, with no serious downsides. Recommended for frequent travelers. I have crippling back/knee pain. 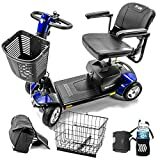 I want to be able to enjoy daily activities (shopping, grocery, going out with friends and family) without depending on others to move me around. When looking for a power scooter you want to make sure the one you buy matches your needs. Some scooters do a great job of making sharp turns. If you plan on using your scooter mostly indoors this is especially important. You don’t want to get stuck trying to turn into another room. If your scooter will be mostly for outdoor travel you will want a model with more rugged wheels. Not all mobility scooters are created equal. If you plan on doing a lot of travelling with your scooter you will want one that has a large operating range, that is, one that can go many miles on a charge. Some scooters have an operating range around 10 miles while others can go up to 30 miles or more before needing to be recharged. If you only plan on taking your scooter to the grocery store or on an occasional trip around the neighbourhood in lower operating range is probably fine. If you want to go explore the Grand Canyon you definitely want to find a model with a long operating range. The basic power scooters that you see provided in stores are often very slow. If you purchase your own mobility scooter you can choose a higher-speed model that may have a max speed of 20 miles an hour or more. If you have difficulty with your hands and precise steering movements you may want a slower scooter. A high-speed power scooter is great if you plan your scooter to get around town instead of car. Battery life on a motorized scooter is incredibly important. Many electric scooters have enough battery power to travel up to 14 or more miles on a single charge. The best models can travel 19 to 20 miles. It is important that your scooter can handle long distances, especially if you plan to use it outdoors.If your battery is dead you are not to go anywhere, so you want to pay careful attention to battery life when shopping around. You may be able to replace the battery on your scooter with a higher powered model but it’s best to purchase a scooter that has a battery life that will meet your needs from the get-go. Most of these electric scooters in our recommendation below can be charged overnight or while you’re at home and not using it. Hopefully, your mobility scooter will last you for many years. To get the most out of your scooter pay careful attention to the warranty. A good warranty means the manufacturer stands behind its product. Warranties may cover things like wheel malfunctions and seat cushions that wear out early. Often the warranty will pay for both labour and parts costs. Batteries on power scooters often covered by separate warranty. Is very important to understand how long your battery is under warranty as this may be one of the most expensive parts replace and is the most vital. If your insurance covered your power scooter they may require you to use it for five or more years before buying a new one. You want to make sure you’re covered if your battery goes out before that period ends. If you plan to use your scooter only around the house you probably won’t need to worry too much about portability. However, most people use scooters both in the house and in town. Portability then becomes an important consideration. You will want to load your scooter in your car or load onto a car carrier. If portability is important, you might want to consider getting an electric wheelchair instead. Some Electric wheelchairs can be large and bulky, some weighing more than 200 pounds. If you plan to frequently transport the chair, you want a model that can easily be transported to your home or with your vehicle. Some power-operated wheelchairs can fold in half, allowing for easy transportation, while on others may fold down to much smaller dimensions. A power scooter should give you the maximum independence possible. For this to happen, you need to be comfortable in it. If you plan to use the chair for long periods of time or for most of the day, you want a product that offers plenty of seat padding. Some products also offer excessive padding on the backrest to ensure additional comfort. If the seat rubs or your back is uncomfortable chances are the scooter is just going to sit in your garage. You may want to consider an ergonomic seat and consult a physical therapist or other professional before you buy the scooter. Try to avoid electric wheelchairs that do not provide a headrest. Mobility scooters offer many different accessories depending upon the model. If you use crutches you want to find a scooter that has an attachable crutch holder. Depending on whether you are right or left handed, you want to ensure the joystick and button controls are installed on the correct side of the wheelchair. The best models also feature swinging joysticks so you can move the joystick out of the way when you’re sitting at a table or desk. If you plan on using your scooter outdoors at night you will want one that has a headlight. Some scooters are also specialized for people who have difficulty using one of their hands. These scooters have special adapters for use with one hand. Depending on the brand you may also have a choice of colour. If you’re going to use your scooter a lot get one that looks fun see you can enjoy riding in it. Power scooters vary significantly in cost. The chair you choose will be dictated in part by how much you can afford or how much your insurance company is willing to pay. Electric wheelchairs are covered by Medicare as long as you meet certain criteria. Power-operated wheelchairs are covered under Part B coverage, which includes medical equipment and supplies. Medicare Part A coverage, however, does not cover these products. Additionally, your healthcare provider must verify the need for an electric wheelchair or scooter and write a prescription for the chair. You have the freedom to choose the chair you desire, but it must be approved by Medicare and purchased through a Medicare supplier. You may pay 20 percent of the cost depending on several factors, including the chair you choose and its original cost. You may also have pay for accessories like headlights and crutch holders unless you have a doctor’s note stating that the accessory is medically necessary. A power scooter can change your life. Walkers and manual wheelchairs can tire you out and try to keep up with everyone on long trips can be exhausting. Mobility scooters give you back your freedom whether that’s around town or on a road trip. The decision to purchase a new power wheelchair can sometimes feel like an overwhelming task. With so many different types available on the market it can be difficult trying to figure out which one is best. Hopefully, this guide will help you make the right decision based on types, features and requirements for your own personal needs. While lots of questions and concerns may arise throughout the process, choosing the right electric powered wheelchair or scooter will actually be an easier task than you probably think. Mobility scooters offer a wide variety of benefits to both younger and older people. The user can get around the house or neighbourhood without requiring assistance from anyone else and that gives them a huge boost of independence. Injury prevention is another benefit for older users. Our physical strength decreases with age and falls become a major risk. But your chances of a hard fall will decrease significantly with the aid of a mobility scooter. Finally, when using a mobility device you’ll be able to get around much faster and with much less energy. The extra time and energy you save by using a mobility scooter can make getting around fun again! This includes a wide array of medical issues that negatively impact muscle tissue and the overall positioning of the body at rest: cerebral palsy, post-stroke, multiple sclerosis, ALS (amyotrophic lateral sclerosis), traumatic brain injury, Parkinson’s disease, muscular dystrophy, Guillian-Barre syndrome, etc. Muscle weakness, atrophy, and hypertonicity will impact how each and every joint moves or freeze in place. Skilled clinicians would be able to ascertain what type of seating system would benefit Dorothy. Persons who have limited trunk control and hip mobility would sit more comfortably in a tilt-in-space seat versus a captain seat. Persons with acute or chronic breathing problems may require the constant use of an oxygen tank. If that is the case, you might want to look at wheelchairs that can accommodate for a tank holder and cord. You could also look into lightweight, portable oxygen systems which save them money and energy on tank refills (e.g. this). The resting position of the spine will determine the most appropriate back and head support. Such conditions include scoliosis, lordosis, kyphosis, spinal fusions, and herniated discs. Attempting to force an atypical spine into a standard captain seat could result in unnecessary pain and/or further deformity. Medical equipment specialists can provide details about various back supports (contour, custom mold, padding, etc.) available. This specifically pertains to pressure ulcers that are secondary to other conditions. For example, people with Type II diabetes are prone to skin breakdown which can result in non-healing wounds or ulcers. Movement disorders which force persons to remain in one position for too long can also result in non-healing or staged pressure ulcers that are fatal if left untreated. Individuals who are seated in powered wheelchairs for a prolonged period of time, and who do not have the capacity to pressure-relieve (lift themselves up with the assist of their arms) are at a high risk for skin breakdown (i.e. paralysis from the neck down). If this is the case, then the customer needs to seriously consider custom padding, tilt-in-space features, and specialized wheelchair cushions that can provide the relief for them. Acknowledgement of visual deficits is really an acknowledgement of safety concerns in operating a powered wheelchair. Users who can simply correct visual problems with glasses or contacts should be able to safely operate a powered wheelchair. Persons with more serious conditions including macular degeneration, cataracts, tunnel vision, hemianopsia, etc. should consult with an eye specialist and their primary physician to determine if they have the appropriate eyesight to operate a chair with a motor. This is similar to visual impairments in that the individual needs to recognize whether or not they have the cognitive capacity to operate a powered wheelchair. Cognitive disorders include dementia, post-stroke, traumatic brain injury, or any other type of condition that negatively impacts someone’s safety awareness for themselves and for others around them. If the individual attempts to operate a powered wheelchair with a known cognitive condition, it could result in serious injury to themselves and to anyone that might get in their propulsion path.
. Possible secondary complications (sore shoulders, wrists and elbows) after long-term use. Electric / Power Scooters . Aesthetics, does not look like a wheelchair.
. Swivel seat may allow for easier transfers in and out of the seat. . More complicated to transport in a car than a manual chair.
. Less flexible to modify to changing physical conditions than a power chair. Power Wheelchairs . Greatest mobility range with least exertion.
. Easier to modify over time, if needed.
. Available with power seating options tilt and/or recline. . More Expensive.
. More difficult to transport.
. Less reliable than manual wheelchairs. Deciding between a manual or motorized wheelchair is often a very personal decision since both offer advantages and disadvantages. The biggest differences can seem visible and obvious, but there are other important factors which may not be related to the vehicle at all. An electric wheelchair more closely resembles a manual wheelchair in its design. You power the device by using buttons and a joystick. Electric wheelchairs also have excessive padding on the seat, backrest and headrest to ensure comfort for full-day use. An electric wheelchair usually has tighter turning radiuses and are fairly easy to maneuver. Aside from one being motorized and the other requiring manual pushing, motorized wheelchairs can reduce stress due to their electric power source. Motorized wheelchairs are also much easier for anyone trying to go uphill, and since people do not need to push manually, they’re able to drive and control with more freedom. However, one disadvantage the motorized wheelchair carries would be its weight. This type of wheelchair is heavier and can sometimes be harder to transport compared to the standard manual chair. 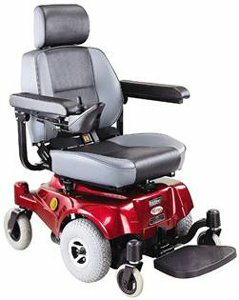 Power chairs are similar to electric wheelchairs except they feature a seat that elevates or reclines to help you more easily get in and out of it. You will navigate it around, using a joystick and a button. The first step to finding the perfect electric powered wheelchair is knowing each type available to you. Did you know there are actually more than a half dozen different types of powered wheelchairs on the market? Review the different types listed below so you understand how each one differs from the other. 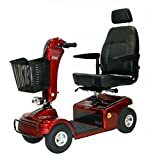 Heavy duty electric wheelchairs are ideal for anyone with a weight over 300 pounds. Heavy duty power wheelchairs also tend to come with larger motors, longer frames and increased torque. Portable wheelchairs offer stability and manoeuvrability both inside and out. They’re lightweight, durable and extremely portable, making them ideal for travelling. Portable powered wheelchairs are also designed to fold up into a small space and easily transfer in and out of the trunk of a car. Standing wheelchairs are designed for those who wish to stand while moving. This type of wheelchair eliminates unnecessary lifting while also improving circulation, digestion, bone development and pressure management. Lightweight wheelchairs are the easiest and most convenient to transport. These power wheelchairs tend to come with smaller motors and frames, making them light enough for anyone to lift. Folding capabilities mean this type of chair takes up very little room, even in the smallest of vehicles. Although lightweight power wheelchairs are not great for rough terrain and tend to be slower in speed, they’re extremely handy when travelling. Rear wheel drive wheelchairs tend to be older models. They’re known for great stability compared to other designs and come with higher speeds and control in mind. With ultra-flexible wheels, RWD power chairs can be driven on almost any type of terrain. They also provide a tighter turning radius compared to some other models. Center wheel drive wheelchairs are built with wheels located under the seat. This allows the chair to be manoeuvred pretty easily indoors and outdoors. Two pairs of casters located in the front and back of this chair give it a boost in stability. Front wheel drive wheelchairs are built with 2 large front wheels that are located close to the leg-rest area. This allows users to easily manoeuvre both indoors and outdoors. FWD electric wheelchairs are designed with lower speed rates in mind and come built with a tight turning radius of between 22 and 28 inches depending on the manufacturer. Transit includes subways, buses, and taxis which are available depending on what country you reside in. For accessible transit systems, call the company ahead of time to inquire about wheelchair access. Today, most subway and bus systems have ramps and chair space available with lock-in systems that prevent the chair from rolling while in transit. Some companies have specialized vans that accommodate for powered wheelchair users who wish to remain seated in their wheelchair during the ride, but they often require a phone-call reservation. NOTE: In the United States, public transit and public facilities have to meet the bare minimum ADA guidelines (American Disabilities Act). They are not obligated to modify their measurements for persons who are morbidly obese. This means that if the powered wheelchair is wider or heavier than ADA regulations, then public transit systems reserve the right to not allow the customer onto the bus, van, or subway. With purchasing a wheelchair often comes spending money on transport equipment. Such equipment includes car lifts and ramps. If the customer can get away with a standard wheelchair frame with very few customizations, then a powered, foldable frame would be the cheapest option. The customer can simply collapse the frame down and throw it into the trunk of a car. For heavier, more unique chairs (tilt-in-space, bariatric chairs), customers will need to research wheelchair vans, interior lifts, exterior lifts, etc. Some individuals who are in a homebound situation or reside in assistive living will potentially have access to transport vans already that can accommodate for full-sized powered chairs. In those cases, purchasing a ramp or lift may be unnecessary. Indoor residences can include private homes, nursing facilities, hospitals, and assistive living centers. Indoor surfaces include both private residences and public buildings/facilities (restaurants, doctor’s offices, schools, churches, department stores, etc). Potential surfaces are generally predictable and smooth (i.e. carpet, tile, linoleum, cement, wood, etc). Aside from the surface of the floor, powered wheelchair users must also consider space between barriers. If the user is located in an assistive living situation in the U.S., then it is more than likely that their living quarters is accessible enough for a powered wheelchair. For private, older homes, the customer needs to consider the following spaces and measurements: porch size, steps, doorway widths, hallways, bathroom space, door thresholds, bedroom space, kitchen space, stationary and non-stationary furnishings, etc. Persons that are buying a powered wheelchair for strictly indoor use can be flexible about the type of wheel placement their chair will have. For example, there are multiple Jazzy powered wheelchairs that come with mid-wheel technology that is specifically designed for indoor surfaces and for manoeuvring around tight spaces as seen in a private home (e.g. manufacturers like this and this). Propelling a powered chair in the community allows tremendous independence and access, but comes with a high level of unpredictability. Surfaces include sidewalk cracks, grates, curbs, gutters, thresholds, ramps, grass, mud, and gravel. Weather changes like precipitation will drastically change those surfaces with puddles and ice, which can cause the powered wheelchair to lose traction. Customers who plan on using a chair for community use need to ensure that the chair they are interested in was designed for outdoor use. Any mid-wheel system with small castor wheels was NOT created for indoor use and will result in stalling the chair and/or injury to the user. Outdoor chairs must have larger castor wheels with a front-wheel system that can navigate the variable terrain. The controller on your new wheelchair will be extremely important since it allows you to handle a variety of different tasks by operating the keypads and joysticks. Taking control of the joystick in any direction will unfasten the braking system and allow it to budge slowly. On the other hand, moving the joystick away from the neutral position will start increasing its speed. Your new power wheelchair will use one of four different types of batteries: wet, lithium-ion, gel and AGM. These batteries are comparable to car batteries, only their functions work in different ways. Wet Cell Battery – These are made to hold longer battery life as compared to gel-type batteries. However, these batteries contain liquid acid which can be harmful if the battery leaks. Lithium-Ion Batteries – Lithium-ion batteries are becoming a favourite among power wheelchair manufacturers due to their long-lasting energy power. The fact that these types of batteries are lightweight is another plus. When compared to a lead-acid battery that can store 25-watt-hours per kilogram of battery, lithium-ion battery stores up to 6X the energy, making it an ideal choice for lightweight and power wheelchairs. They’re also environmentally friendly due to them being non-hazardous. Gel Cell Battery – A gel cell battery comes with less acid inside, making it much safer to transport. All acid content is protected and sealed with silica gel that guarantees no spilling will occur. However, these batteries can cost more and do not hold a long battery life. Absorbed Glass Mats – Absorbed Glass Mats (AGM) batteries are considered the “latest edition” in battery technology. This type of battery comes manufactured with sealed acids in a boron-silicate glass mat that prevents it from spilling or being affected by temperature. Don’t let the cost of a new electric wheelchair scare you or push you away from trying to get one. Once people have their heart set on getting a new wheelchair the next question they often ask is how they’re going to pay for it. First, it’s recommended that you contact your health insurance company to see if they will cover the expense fully or partially. You can also speak with your doctor to see if there are any solutions that he or she can assist with, such as providing you with a note that you can give to your insurance company. Also, check with Medicare or Medicaid to see if you qualify for financial assistance from them. As another final option, seek out a loan or make your purchase with companies that offer wheelchair financing with a small monthly payment plan. Will I be using the power wheelchair outdoors, indoors or both? Deciding where you will be driving your wheelchair is an important question. Smaller wheel sizes are ideal for driving around the house or on minimal rough terrain such as gravel. However, those wanting to drive on more unstable grounds should look for an electric wheelchair that has larger tires on it. 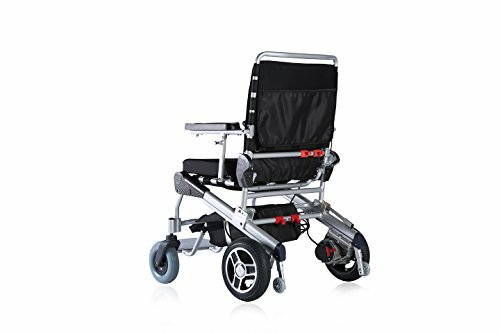 What speeds will I be needing this wheelchair to reach? Electric powered wheelchairs offer various maximum speeds and this is something you should take into consideration before you purchase. Speeds range between 4-9 miles per hour depending on motor size. Will I be transporting the wheelchair in cars, trains, buses or planes? If you travel often, be sure to choose a standard size chair that can be easily disassembled or folded if necessary. You can also check with local dealers to see if they have any mobility vehicles available which can lift your wheelchair automatically and make personal transportation with larger chairs easier. What type of seating style is most comfortable? A standard electric wheelchair comes built with a standard sling or high back captain seat. These are normally designed with padded vinyl material and are comfortable enough for most people to use. But if you’re worried about the possibility of sores forming, you may want to consider buying solid seat pans with gel or foam cushioning inside. What is the powerchair’s weight capacity? Standard travel wheelchairs have a weight capacity of around 250lbs. If you’re in need of a chair that can handle more, it’s best to look for a heavy duty model. Some can even hold a maximum weight of up to 700lbs! How to change Mobility Scooter’s battery?